He played it all that way, with a paused then hurried rhythm that no metronome could follow. There was no placid regimented tempo to Taps. The notes rose high in the air and hung above the quadrangle. They vibrated there, caressingly, filled with an infinite sadness, an endless patience, a pointless pride, the requiem and epitaph of the common soldier, who smelled like a common soldier, as a woman had once told him. They hovered like halos over the heads of sleeping men in the darkened barracks, turning all the grossness to the beauty that is the beauty of sympathy and understanding. Here we are, they said, you made us, now see us, dont close your eyes and shudder at it; this beauty, and this sorrow, of things as they are. This is the true song, the song of the ruck, not of battle heroes; the song of the Stockade prisoners itchily stinking sweating under coats of grey rock dust; the song of the mucky KPs, of the men without women who collect the rags of the officers’ wives, who come to scour the Officer’s Club–after the parties are over. This is the song of the scum, the Aqua-Velva drinkers, the shamelessness who greedily drain the half filled glasses, some of them lipstick smeared, that the partyers can afford to leave unfinished. This is the song of the men who have no place, played by a man who has never had a place, and can therefore play it. Listen to it. You know this song, remember? This is the song you close your ears to every night, so you can sleep. This is the song you drink five martinis every evening not to hear. This is the song of the Great Loneliness, that creeps in the desert wind and dehydrates the soul. This is the song you’ll listen to on the day you die. When you lay there in bed and sweat it out, you know that all the doctors and nurses and weeping friends don’t mean a thing and cant help you any, cant save you one small bitter taste of it, because you are the one thats dying and not them; when you wait for it to come and know the sleep will not evade it and martinis will not put it off and conversation will not circumvent it and hobbies will not help you to escape it; then you will hear this song and remembering, recognize it. This song is Reality. Remember? Surely you remember? 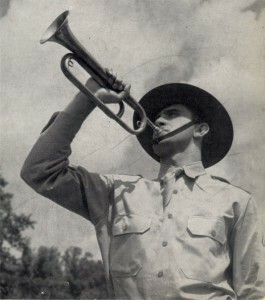 This entry was posted on Monday, December 5th, 2016 at 7:29 pm	and is filed under Bugle Stories, Buglers Through History, General Interest, History of Taps, History of the Bugle, News. You can follow any responses to this entry through the RSS 2.0 feed. Both comments and pings are currently closed.